Raccoon Repellent - What Works The Best? Using a raccoon repellent can be a safe and effective way to deter raccoons from your home or yard without the use of traps. Lets face it......trapping a raccoon might not be for everyone. Traps involve close contact with a confined wild animal. A trapped raccoon inside of a live trap can be a little temperamental at times. Their demeanor can range from calm to very aggressive depending on the raccoon. If the thought of handling traps or an angry raccoon doesn't sound appealing to you, using a repellent to deter them might be the best solution. To learn more, lets look at a few different options to help deter or repel an unwanted raccoon. One of the easiest ways to repel an unwanted raccoon is to simply purchase a commercial repellent by a reputable manufacturer. Typically commercial repellents are available in a powder or granular form and contain either a mixture of coyote urine or cayenne pepper. They work by either repelling raccoons through the use of coyote urine which simulates a predator in the area, or using pepper oil as an irritant. Do they work? Well, it really depends on the situation. Some users have very good results and swear by the products while others are not as impressed. Using a motion activated sprinkler is a great way to scare off an unwanted raccoon from your flower bed, freshly installed sod or garbage can. They're easy to use, environmentally friendly and they can be used to repel a variety of different animals. 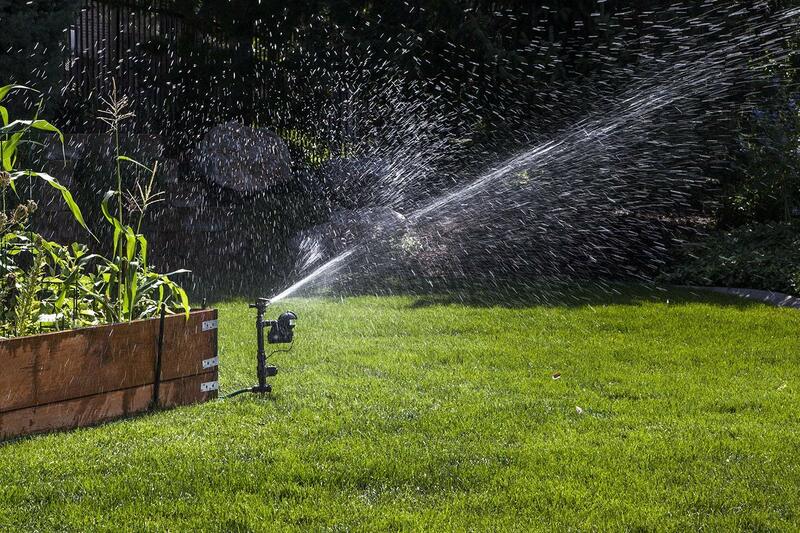 Sprinklers work well because you don't have to worry about smelly odors or reapplying the scent after it rains. With a sprinkler you can set it and forget it. Here's a little tip.......since raccoons are typically nocturnal and only come out at night, purchase a water timer and set the timer from dusk to dawn. This eliminates the need to turn off the water every time you go to the dumpster. We like to use the sprinkler around our garden to keep the deer away. They work really well plus the garden gets a little drink in the process. One downfall to the sprinkler is their limited range. Unless you buy several, you wont be able to cover your whole lawn. They work best for specific areas like a garden, flower bed or garbage can. If you want to make your own homemade repellent you have a couple of options. Ammonia - One of the easiest ways is to take a small dish, fill it with ammonia and place a rag in the dish. The smell of the ammonia repels the raccoon and the rag acts as a wick to help disperse the smell. Once the dish runs dry simply add more ammonia. This method works well in confined spaces like attics, chimneys and garbage cans where the lack of air flow concentrates the smell. Hot Pepper Solution - Take one can of cayenne pepper or one small bottle of Tobasco sauce and mix it with one gallon of water. Add one teaspoon of dish soap which will help the solution adhere to the plants or item you spay it on. Place the mixture in a spray bottle or pump sprayer and spray the area you want to protect. To be effective, you need to respray the area after a hard rain or once every 3 or 4 days. Raccoons are notorious for dumping garbage cans over and helping themselves to a free meal leaving behind a yard full of garbage. To prevent this, use a bungee cord or ratchet strap to secure the lid on your garbage can. I like to use a ratchet strap because you can really lock the lid in place. 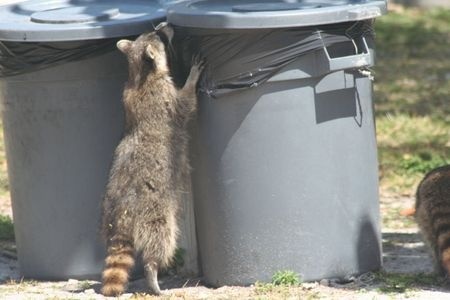 Once the raccoons learn they can't get inside the garbage can they will move on. Finally......once you successfully repel the raccoon from your attic or chimney, remember to seal off any entry holes or install a chimney cap to prevent any further problems.